The red mahseer is highly sought after by anglers and high end restaurants. Breeding them may be a bit easier now that UPM researchers have found the best feed combination. The ikan kelah merah or red mahseer has been crowned the “king” of the Malaysian river not for no reason – the expensive and elusive fish is the dream catch of any angler or the sought-after dish of any gourmet. The fish which is called “empurau” in Sarawak can fetch from RM800 to RM1,200 per kilo live weight, is the holy grail of fish farmers and breeders today. But unlike the Arowana which is widely bred for the aquarium, ikan kelah proves to be difficult because breeders have problems with finding the right or best food for the fish they are desperately trying to culture for the potential high returns. In its natural habitats in the cool, fast and clean waters of the upstream of major Malaysian rivers, kelah feeds on riverine fruits like engkabang, dabai, ensurai, ara and kepayang and small crustaceans, being omnivorous. 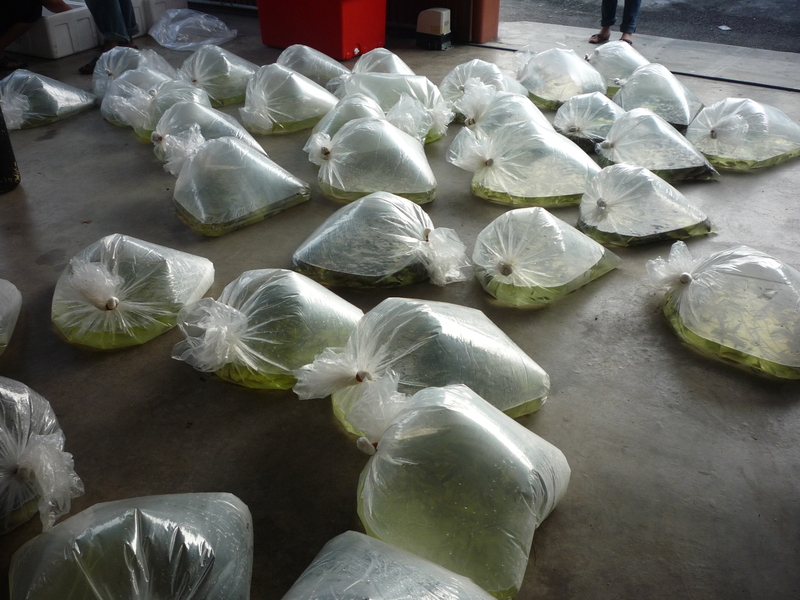 But in the ponds and tanks where they are bred for the market (or aquarium for those who keep the kelah for ornamental purposes), the fish have yet to get the right feed to optimise its growth. For this reason, a group of scientists of Universiti Putra Malaysia (UPM) are working to come out with the right complete and balanced feed for the kelah. “We will have the prototype of the best feed for the kelah next year,” said Prof Dr Mohd Salleh Kamarudin, Head of the Aquaculture Department of the Agriculture Faculty of UPM, who is also a specialist in aquaculture nutrition. He and his team of researchers have been trying out the best combination of diet for the fish in captivity, knowing that in the wild, the kelah feeds on fruits that fall into the river, and small crustaceans. “We are looking at its protein, lipid, carbohydrate and other requirements and we hope to come up with the prototype early next year,” he said. Prof Salleh said their research found that the fish thrive better on vegetable oil, especially palm oil, rather than fish oil. Coincidentally anglers prefer to use oil palm nuts as bait when fishing for kelah. “The kelah is a slow growing fish and that is why we need to find the optimal nutrition for the fish. Interestingly, the kelah needs a high protein and carbohydrate but low fat diet to grow faster while a high fat feed will suppress the growth,” he said. He also said despite the success of induced spawning programme for kelah, the high percentage of deformities among the hatched larvae needs an amicable solution. “This means that the domesticated broodfish or parent fish are not eating the right diet, and that is why we are also searching for the best feed for the kelah broodstock,” he said. The kelah is not just the “king” of the Malaysian rivers but also the streams and rivers from the Himalayan mountains to Southeast Asia or in countries like Afghanistan, Pakistan, India, Bangladesh, Nepal, Myanmar, Sri Lanka, Thailand, Cambodia, Laos, southern China, Vietnam and Indonesia. The fish which can grow as big as a man, is a major tourist draw in the mighty rivers of southern India where anglers from around the world pay a small fortune for the thrill of hooking a mahseer before releasing it back to the river. It is therefore not surprising that scientists and researchers have gravitated to the fish. 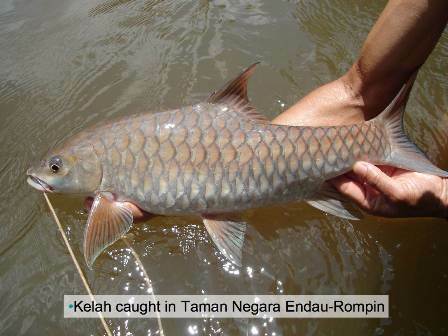 In the case of Malaysia, research on the kelah merah had started more than a decade ago, leading to the convening of an international symposium on the mahseer in Kuala Lumpur in March 2006 that was anchored by UPM. Assoc Prof. Dr Siti Khalijah Daud, a biologist with the Science Faculty had led a research team with a grant of RM2 million in 2007 to get the kelah to spawn and breed in captivity. “We had our first success in induced breeding with the first generation fish in captivity in early 2010 at the LTT Aquaculture Sdn Bhd in collaboration with the Indigenous Fisheries Research & Production Centre in Tarat, Serian in Sarawak,” she said. The first generation fish refers to those that were raised from the eggs of the “wild” kelah that were caught and reared for breeding purposes. The team had experimented with different hormones in order to induce the female to ovulate and spawn. The fish in the wild will spawn at the start of the monsoon season in Sarawak and rainy season in Peninsular Malaysia. She said they found that the female kelah of more than a kilo to 2 1/2 kilo were mature enough to spawn while the male fish could start breeding from 200 to 850gm. They also found that the kelah do not spawn in one go but in two or three clutches in different places in the rocky bottom of the fast-flowing stream. For induced breeding, they would “hand-strip” the female for the eggs and the male for the sperms. Their research, she said, covered all aspects like genetics, hormonal profiling, reproductive biology, induced breeding, nutrition, broodstock management, diseases, habitats and so on. While Dr Siti Khalijah would encourage fish farmers and breeders to go into kelah farming for the high returns, she cautioned that water management is of upmost important. The kelah is getting more and more scarce in the wild, especially in Peninsular Malaysia because of deforestation and environmental degradation. In this regard, she is glad of the “Tagal” system in Sarawak and Sabah where the villagers themselves guard and protect their empurau in their rivers and now the fish population has recovered in the wild in the states where the fish has been declared as the national fish of Sarawak.